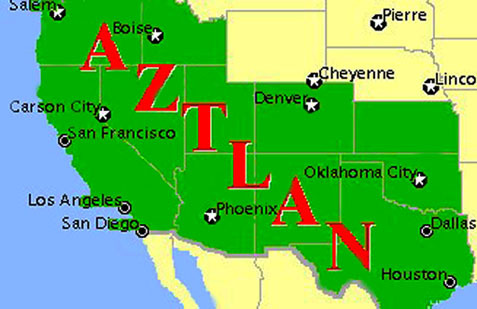 In 1969, the radical leftist group Movimiento Estudiantil Chicano de Aztlan (MEChA) produced a document titled "Spiritual Plan of Aztlan," a document which now serves as a manifesto comparable in influence over many Mexican-Americans to the brutal hold that Mein Kampf held over the German people during Hitler's disastrous rise to misplaced power. MEChA's fusionist manifesto encourages Mexican-Americans to betray the United States government by reclaiming "the land of their birth" and bringing the seven Southwestern states into the fold of the Mexican government. I was friends with some of the MEChA fusionists at Yale, and I have to say that what they believe now is even scarier than what the original drafters of the separatist manifesto believed and followed back during the 1960s. Many of MEChA's heads today are fully convinced that the United States needs to be returned to its "indigenous roots," a process by which the Supreme Court is superseded by a newly-appointed tribal council with the power to undo the decisions of the highest court of the Republic and the people. In MEChA's new Amerika, tribal blood will be more important than legal qualifications, merit, and previous accomplishments, and anyone who doesn't toe the line will be deemed a traitor, as I was. I basically expected her to spit on me and call me a "gringo-lover" when I told her Mexico is not part of the US and that the Southwest has been part of the US for long enough that Mexico's contributions to the region are as significant and relevant to modern-day America as the Spanish occupation of the region before Mexico existed. She walked away from me when I asked her if we should give Puerto Rico back to Spain, telling me that there was no "indigenous movement in Spain" that would "justify bringing them into the Puerto Rican fold." So, it's apparently okay to give back 7 states full of diverse people to a pan-indigenous North American group to do what they want with them, but one commonwealth that speaks the same language as its most recent owner is out of bound because the racist reasons don't align.